Romance languages, like Spanish or Italian, like agreements. Adjectives end in the same letter as nouns they modify. Nouns are either masculine, feminine or neutral. The word “pizza” in Italian, is feminine and ends with an “a.” Were it masculine, it would be called “pizzo.” But we know better. White pizza stands without tomato sauce. It’s enjoyed for the crust alone or adorned with ingredients like potatoes or cheese. We call this pizza bianca. So why is it that people flock to a pizzeria called Pizza Bianco when we cannot trust their Italian grammar? 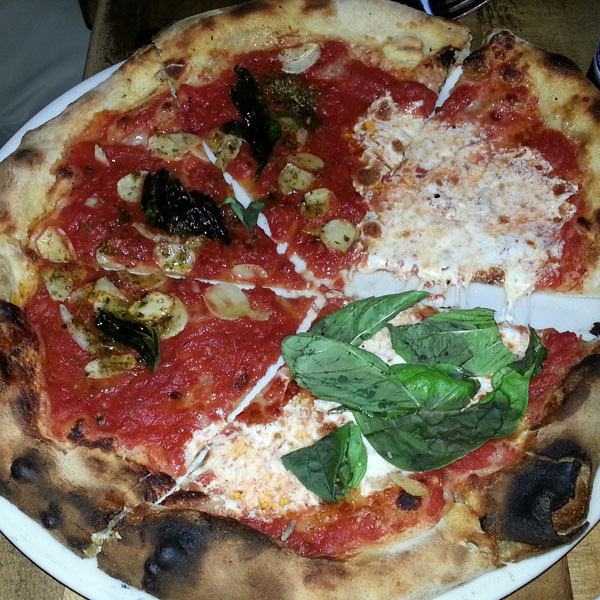 In Phoenix, Chris Bianco creates legends in pizza. It is his surname that twists the convention of gender-matched words. This is Chris’ pizza. He invites us on a culinary journey that begins with a perfect crust and locally sourced ingredients. Cheese is a master manipulator. Smother mozzarella on just about anything and you can get diners coming back for seconds. Try making pizza without it. It’s as easy as singing acappella. Not for the novice. Chef Chris makes pies without cheese as profound as the way as Adele sings without music. His marinara pizza, the mariner’s style, showcases hand-crushed tomatoes and fresh garlic. If flavors could have an exponential function, we would note it here. 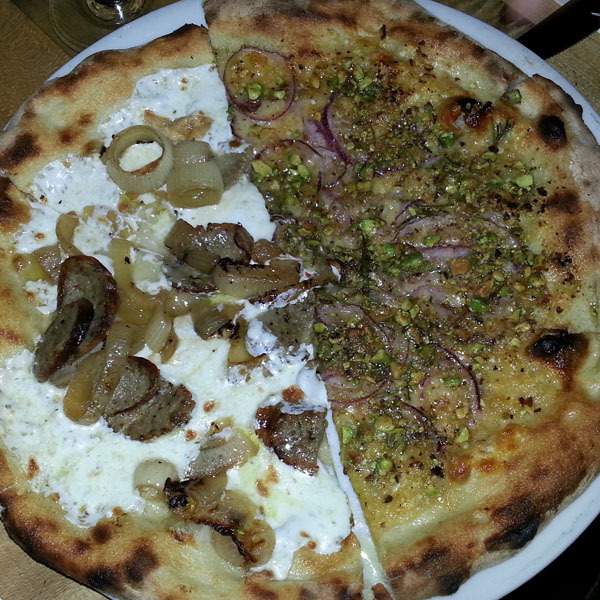 Chef Bianco tips his hat to the dramatic when he names sausage and onions pizza as Wiseguy. We won’t mention here that Mr. White was the code name give to the criminal leader in Reservoir Dogs. Chef Bianco looks nothing like the character played by Harvey Keitel. 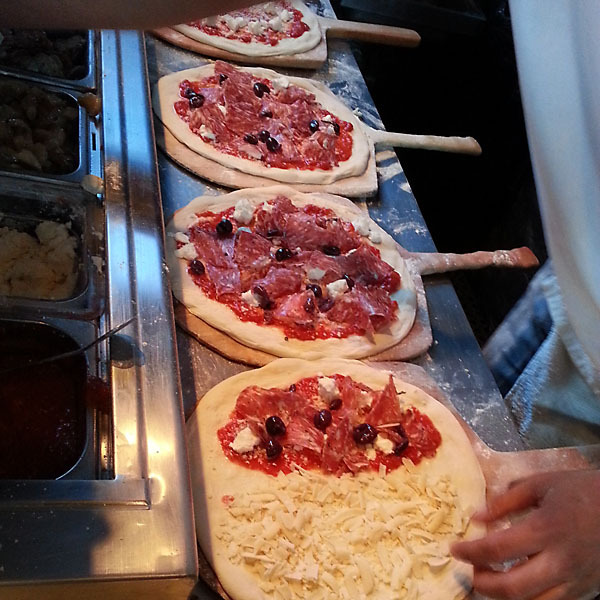 Rosa is the name given to pizza covered with Arizona pistachio, red onion, rosemary and Parmesan. The combination reflects genius thinking. The bite of rosemary and onion temper the nutty rich flavors from the cheese and nuts. Pizza Bianco is as Italian as it gets. It celebrates the austerity of pure ingredients. It features a natural sense of design. It encourages experimentation and fellowship. It spits crusty dough from a wood burning oven whose temperatures rise to 850 degrees. So if you are ever Phoenix, make plans for Pizza Bianco. And bring your amici. It’s easier to trade slices with them than with strangers at other tables. Wouldn’t you agree?